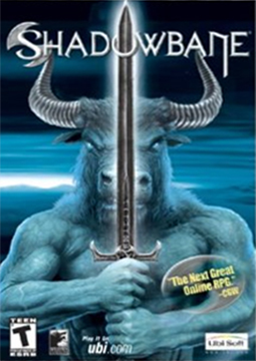 Shadowbane was a free fantasy computer role-playing game (MMORPG) created by Wolfpack Studios and published on March 25, 2003 by Ubisoft for Windows and Mac platforms. Originally commercial and subscription-driven, Shadowbane was launched in March 2003, and was the creation of text-MUD veterans J. Todd Coleman, James Nance, Josef Hall, Patrick Blanton and Robert Marsa and a team of 45 programmers, designers and artists. It closed on July 1, 2009. Shadowbane was a top-10 best selling PC game at launch, and was noted for two things. First, the majority of the game world allowed for open Player-vs-Player combat, making it an early pioneer title in the PvP MMO genre. Second, it was the first major MMO to offer dynamic world content as a primary feature of the game. Most MMOs (such as Everquest) are static, meaning the world itself does not change based on player actions. Dynamic worlds allow player to change the game world itself; morphing terrain, building and destroying buildings and fortifications, and setting up patrol paths for player-hired AI combatants. The game was considered a "cult hit" and continues to sustain a small base of followers, but technical issues plagued the game at launch and failed to retain much of the early fanbase shortly after launch. On 17th April 2009, it was announced that Shadowbane would be shutting down its servers as of 1st May 2009, however petitions were started by Shadowbane fans to keep the game from the announced shutdown, and due to support and enthusiasm of the remaining player community, on 29th April 2009, it was announced that Shadowbane shut down would be postponed till 1st July 2009. I remember being really excited about this game in 2001/2002, and then it finally came out on my birthday. It sucked. The graphics were awful, the load times were long, the gameplay was crappy...the only thing that was good was the customizable interface. I played for about three months and quit. I wish I could get my money back.